Fresh fruit salad is supposed to be very healthy for all and is rich in different sorts of nutrients required by the body. The vibrant colours of the fruits add a great beauty to the salad and kids and even the diet conscious people get attracted to it much easily. 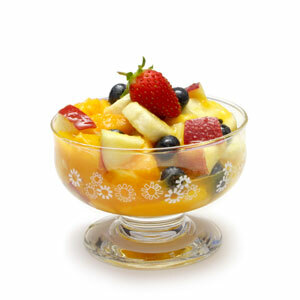 Here is an easy recipe of fruit salad that can be tried by people of all the ages. 1. Toss chopped peach, apple, plum, banana along with sea salt, walnuts, sugar and mix fruit juice in a bowl. 2. Now add honey and lemon juice and ginger juice to the bowl of tossed ingredients. 3. A splash of mix fruit juice can be now added again to the fruit salad. 4. Now shake the contents well by covering the bowl 6-8 times so that the ingredients mix well and fruit juices are released as well. 5. Add figs to the salad bowl and chill this salad for half an hour by covering it. Fruit salad is ready to serve. Add the salad fruits to individual glasses and add the whipped heavy cream in a layered form into the glass. Top the dish with strawberries and serve it to your guests and family members.